This is an original study of the connected lives of two important socialists, Tom Mann (1856-1941) and Robert Samuel ‘Bob’ Ross (1873-1931). Born in Britain, Mann travelled the globe as a tireless socialist organiser and propagandist who met Ross in the course of his political work in Australia. They then worked closely together as labour editors, educators, trade unionists and socialists in Australia and New Zealand between 1902 and 1913. Thereafter, they continued regularly to correspond with one another and other socialists in Australia, New Zealand and other parts of the Pacific Rim. 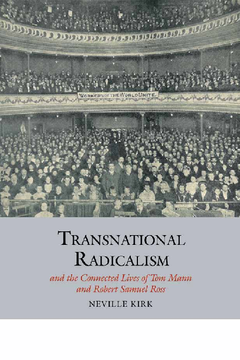 Based upon extensive research into neglected primary and secondary sources in Britain, Australia, New Zealand and related places, this book explores the careers and lives of Mann and Ross as paired transnational radicals, as leaders who crossed national and other boundaries in order to promote their socialism. It situates them within the neglected English-speaking and even global radical worlds of the later nineteenth- and early twentieth-centuries, a period that constituted an early phase of globalisation. Breaking new ground in moving beyond the national focus which has dominated much of the relevant history, this book highlights both the importance of Mann’s and Ross’s transnational endeavours, attachments and identities and the ways in which these interacted with their national, sub-national and international spheres of activity, striking a chord with a wide variety of radicals seeking change in today’s globalised world. Neville Kirk is Emeritus Professor of Labour and Social History at Manchester Metropolitan University. His publications include Labour and Society in Britain and the USA (1994), Comrades and Cousins (2003), Custom and Conflict in 'The Land of the Gael' (2007, 2009) and Labour and the Politics of Empire (2011, 2014). He is editor of Liverpool University Press's series Studies in Labour History and a member of the executive committee of the UK Society for the Study of Labour History.